April continues to hold her fragile world together, but the ties that hold her family together are quickly unraveling. Rumors of a massive human underground settlement draw her to the shadows of the city once more in search of other survivors more like her, even with the hybrid The world has changed. One must adapt to survive or hold on to the crumbling shards of humanity. To ask other readers questions about Disarming, please sign up. I received an ARC of this book from the author to read for a review! April is back and badder then ever and she may have discovered she may not be the on I received an ARC of this book from the author to read for a review! The end of the world has changed everything. April no longer knows what's up or down. Vampires are now in existence, determined on changing everything as she knows it. Granted, she's not exactly human herself, but she's not a vampire either. Content to have her family back in her arms, April does her best to come to terms with the unexpected situation. She knows things will never be the same, though she can't help but to wish that things were the way they used to be. Part of her yearns for the no The end of the world has changed everything. April no longer knows what's up or down. Vampires are now in existence, determined on changing everything as she knows it. Granted, she's not exactly human herself, but she's not a vampire either. Content to have her family back in her arms, April does her best to come to terms with the unexpected situation. She knows things will never be the same, though she can't help but to wish that things were the way they used to be. Part of her yearns for the normality she and her family used to know. She wishes she could see her mother smile again. To know that she and her family will be safe, once and for all. Yet she knows that will never be. As the Ferals continue wreaking havoc on the world around her, April soon comes to the realization that there's more at stake than she knew. Someone out there must know what's going on. Surely, she'll be able to find the necessary information to make sense of what's going on? Or so she thinks. When news of an underground city reaches April's ears, she becomes determined in finding out as much about it as possible. Granted, this supposed city is just heresay, but if she can find the needed information, perhaps she and the hive she's now a part of can make something of themselves in the long run. The question is, will she be able to do what she needs to do without jeopardizing herself and others in the process? This review has been hidden because it contains spoilers. To view it, click here. Ok so this review is really a 4.5 stars. I, of course, loved it. It was a thrill ride. We get to see April fighting her feelings for Rye, and trying to take care of her brother and mother after their time with the bad vampires. We meet a few new characters in this book and I have to say. I am a fan. Including Elijah. Who calls the rabid's my favorite word....oh man. I squeed like a 12 year old when I read the word zompire in this book. The plot definitely thickens as April finds out that there i Ok so this review is really a 4.5 stars. I, of course, loved it. It was a thrill ride. We get to see April fighting her feelings for Rye, and trying to take care of her brother and mother after their time with the bad vampires. We meet a few new characters in this book and I have to say. I am a fan. Including Elijah. Who calls the rabid's my favorite word....oh man. I squeed like a 12 year old when I read the word zompire in this book. The plot definitely thickens as April finds out that there is more to the world than vampires and zompires. She makes a whole bunch of trouble for herself and resists Rye. The characters are rounded out. Miranda is back into play. I think her and April's friendship is one of the strong points of the book. Miranda seems to be one of the few characters that willingly lets April do what she wants to do. Like I said Elijah is great. I actually would prefer Elijah as a love interest for April over Rye. I don't know why but Rye just doesn't seem to fit with April. That might be me having a big ole crush on Elijah though. This book has some action scenes in it and they are great. Alexia's writing is at it's best when her characters are in the throes of bloodshed. HOLY MOLY OMG!! OMG the author is killing me!!! Finished Disarming and my mouth is on the floor with all the twists!!! All I can think is .... WHAT NO!!! UGH!! too emotional need to lay down!! lol. What a book and what a story and what a story line!!! This author has me spellbound at how wonderfully this book is written and had me so captivated I could not put this book down. I read it in a day and the ending is AMAZING!!!! Dying for the next book and I so look forward into reading more of this amazing author. I can't wait to see what else this authors got up her sleeves!! The story is full of twists and turns that you won't see coming. The climax and ending are spectacular! We see some characters from the last book, but also meet some new characters. The creepiest is Katrina!! This series I can see being made into a movie series! The characters and their interactions are dynamic! This book picks right back up after the rescue of Helen and Jeremy. April is trying to go back to the way it was before they were taken. Helen's strange behavior and her change in appetite keeps that from happening. Rye is also pressuring her about her feelings that she is not comfortable with. Then events take a turn for the worst when they find a group of people murdering the Feral Vamps while lining up like cattle. Why? Who are these new people and why have they not been seen yet? Can Helen be saved? Will April be killed? I gave this book a 5 star jumping up and down doing flips review since it was so so so good. Wow!!! I was one of the lucky ones to get a copy of this before its release and all I can keep saying is wow!!! I loved this book. Talk about putting someone on the edge of their seat and not wanting to stop reading, this book takes you there and won’t let you go. Ms. Purdy’s words never fail to allow us, the readers, to see, hear, and feel thru her characters own experiences. This story is the continuation of her Reign of Blood story and picks up where it left off. We see how things are now dif Wow!!! I was one of the lucky ones to get a copy of this before its release and all I can keep saying is wow!!! I loved this book. Talk about putting someone on the edge of their seat and not wanting to stop reading, this book takes you there and won’t let you go. Ms. Purdy’s words never fail to allow us, the readers, to see, hear, and feel thru her characters own experiences. This story is the continuation of her Reign of Blood story and picks up where it left off. We see how things are now different for her after the battle against Christian. Her own mother is different and April has to take on a new roll. Rye is still around and hoping with all hope that things will work out for them as his love for her grows stronger. Other humans have been spotted. Where have they been hiding and is there somewhere her brother Jeremy can go and be with kids his own age? How did they survive? These are the questions that April is determined to answer. But she must attempt to do things alone as her hopes grow that her family isn’t the only true survivors of this apocalypse that has invaded their homes. April is going to make discovers that will allow you to have the same “Wow” factor hitting you and not wanting to let go even at the end of this book. You will find yourself asking Ms. Purdy when the next book will be out. Great read for all and I would definitely suggest this to all. Alexia Purdy has captivated me once again with Disarming. I love it even though it has more blood, guts and glory than I am use to reading about. However, once I started I couldnt put it down. We saw different emotions and experiences with April this time but dont let those emotions foul you, she is not weak at all. April was just as fierce if not more so in Disarming than in Reign of Blood. However, this time April was under different circumstances, she is in desperate need to find out what is Alexia Purdy has captivated me once again with Disarming. I love it even though it has more blood, guts and glory than I am use to reading about. However, once I started I couldnt put it down. We saw different emotions and experiences with April this time but dont let those emotions foul you, she is not weak at all. April was just as fierce if not more so in Disarming than in Reign of Blood. However, this time April was under different circumstances, she is in desperate need to find out what is left of Las Vegas. She wonders who is left and is she fated to live in a bunker with her mother and brother for the rest of her life, fighting off feral vampires, or is there more out there fighting to survive just as she is. This is book 2 in the Reign of Blood Series. It was AMAZING!!!!! Full of twist and turns and had plenty of "ARE YOU FREAKING KIDDING ME" moments. Poor April, just when she thinks she is getting things under control, life hits her right in the face. Don't worry April fans, you know how she is, she isn't gonna go down without a fight. This book had me on an emotional roller coaster ride. Great installment to the series. I can't wait for the I was given and e-copy in exchange for my honest review. Okay first let me say that Book 2 is tremendous! Alexia Purdy has firmly placed herself in my top 10 authors. This story begins precisely where we left off in Book 1. We get to see a bit more of the relationship between Rye and April develop before the action begins. This ease of opening, actually helped cement in the readers minds just how confused April is. She wants to love, but truly feels that there is no hope in the hell she calls life. In her own mind she doesn’t believe in happy ever aft Okay first let me say that Book 2 is tremendous! Alexia Purdy has firmly placed herself in my top 10 authors. This story begins precisely where we left off in Book 1. We get to see a bit more of the relationship between Rye and April develop before the action begins. This ease of opening, actually helped cement in the readers minds just how confused April is. She wants to love, but truly feels that there is no hope in the hell she calls life. In her own mind she doesn’t believe in happy ever after any longer which truly is so very sad. But Purdy has written this story in such an engaging manner that when all hope is lost it suddenly all comes to life in a most unusual and unexpected manner. What I liked is that she has to decide if the risk of loving is worth it, or if she should settle for something else. No clues on what the something else is sorry guys you’ll just have to read it yourself. In this book we are introduced to a few new characters, this adds a whole new dimension to the book as we see all the new faces and some old ones which April knew before the world turned to horror. I enjoyed that the prologue started out with April BEFORE the world turned. So we had a glimpse of her home life before the disaster. Alexia Purdy’s writing is so vivid. I stated before and I will state again for this book that her world creation is quite literally phenomenal. Her character creation is top of the line and I can quite attest to now knowing the taste of blood through her characters. I could smell it, taste it and almost feel it. The horrors that April fight her way through were done in such vivid detail that I could see and feel everything. This book totally takes a twist I NEVER expected. I won’t go into details because I truly hate spoilers. What I will say is that this is an action packed page turner of a book. One which will keep you reading long after bedtime, and then almost afraid to turn out the lights for fear that the horrors you just finished reading will somehow truly exist. Now in closing I have just one thing to say…. WHERE IS BOOK 3??? There are no words to explain just how excited I was to be getting back to this story. April is one of my favorite characters so I jumped at the chance to beta read this one for the author. I loved everything about this book. It lived up to my expectations and I was so happy to read it. The author has crafted a masterpiece and I can't wait to have the finished copy in my library and that's saying a lot because it is rare for me to still buy print books since I have my e-reader. The author has ac There are no words to explain just how excited I was to be getting back to this story. April is one of my favorite characters so I jumped at the chance to beta read this one for the author. I loved everything about this book. It lived up to my expectations and I was so happy to read it. The author has crafted a masterpiece and I can't wait to have the finished copy in my library and that's saying a lot because it is rare for me to still buy print books since I have my e-reader. The author has action galore in this book and doesn't disappoint. She had made April even more of a character that I love too. This book picks back up with April once again having a lot on her plate. She has to deal with her new life and the new idea that there may be survivors out there. April and Rye work so well together and he is such a great hero. I love how protective he is of April and how he always wants the best for her even if she can't see it. I love seeing them interact and the author has done such a good job of making them so believable. They just seem to mesh so well together and have such chemistry. I just LOVE these types of books that have a horror fantasy feel- which is mostly described as distopian- but I like being different, and that’s exactly what this series gives me! Set in a destroyed Las Vegas area, it’s very hard to image it not bustling with a ton of tourists! The background of the story is fantastic, and even if you hadn’t read book one, I think you’d be ok jumping right in to book two. It’s definitely worth the read for book one though! April gives me many feelings. First she’ I just LOVE these types of books that have a horror fantasy feel- which is mostly described as distopian- but I like being different, and that’s exactly what this series gives me! Set in a destroyed Las Vegas area, it’s very hard to image it not bustling with a ton of tourists! The background of the story is fantastic, and even if you hadn’t read book one, I think you’d be ok jumping right in to book two. It’s definitely worth the read for book one though! April gives me many feelings. First she’s a teenager who is remarkably strong and responsible. Second she’s lost any part of her childhood she may have had. Third she’s struggling to do it on her own. How could you not love her, want to hug her, feel sympathy for her? I feel all of those! It’s amazing what she’s overcome for her mom and brother and yet it seems it still isn’t finished! I love the secondary characters, and the interactions between them and each other. And I’m definitely all about the action packed bloody messes! I think that’s a big reason why I love this story so much, it’s intense yet endearing, it’s emotional yet calculatingly cold, and it’s over the top thrill rides! I’m kinda devastated I hadn’t heard of this series before!! And the storyline in just exceptional! Once again Alexia has sucked me into her world and had me forgetting everything around me until the very last page and then left me heart broken and begging her for book three. Disarming picks up right where Reign of Blood left off. With April still confused about her feelings for Rye, still fighting feral vampires, and wondering if she and her family are the only humans left. That is until April hears about a massive underground world where humans have survived. April sets off to find them but i Once again Alexia has sucked me into her world and had me forgetting everything around me until the very last page and then left me heart broken and begging her for book three. Disarming picks up right where Reign of Blood left off. With April still confused about her feelings for Rye, still fighting feral vampires, and wondering if she and her family are the only humans left. That is until April hears about a massive underground world where humans have survived. April sets off to find them but in doing so she not only pushes Rye farther away but she has put herself in danger for these humans might just be the one enemy that can destroy her and everything she loves. I loved this book from the first page to the last. We get to see so much more of April and the way she thinks and feels but at times I wanted to just smack her for the way she treats Rye. But I also understand why she pushes him away. In her mind there is no happy ever after just pain and destruction. But one action changes everything for her and she finally admits to herself that she loves Rye. I was so excited when she realized this but at the same time my heart broke because of what she went through to figure it out. As for Rye I have no words that will fit him. He is just perfect and his love for April just pulls at my heart and makes me fall for him. I read this book in rough draft form. The Author was nice enough to give me a ARC Copy of the book and let me tell you I was NOT Disappointed!!! This book was amazing! You won't get any spoilers here BUT this book has lives up to exceptions and some. This book does take a little bit to get into the juicy part of the story but once it does you're on a roller coaster. This book has more twist and turn then I could have ever imagined. As soon as I thought I had something figured out BAM a new twis I read this book in rough draft form. The Author was nice enough to give me a ARC Copy of the book and let me tell you I was NOT Disappointed!!! This book was amazing! You won't get any spoilers here BUT this book has lives up to exceptions and some. This book does take a little bit to get into the juicy part of the story but once it does you're on a roller coaster. This book has more twist and turn then I could have ever imagined. As soon as I thought I had something figured out BAM a new twist and turn is thrown into the mix and it was amazing. I am in love with April! But then, I think everybody is in love with April in Disarming! The second installment of Alexia’s Reign of Blood series is definitely worth the wait! Although her world has grown more complicated, with additional factions and hybrid mutations than she ever knew existed, she continues to make her way through the new reality with her unique style and bravery. But her world is also coming apart at the seams, and her family’s position is becoming perilous! Through it all though I am in love with April! Through it all though, April fills the role as leader, negotiator, and friend. The twists and turns of this chapter of her story invigorated me! It’s like every time I turned the page I was amazed by what I was confronted with next! There really is no better series for fans of Urban Fiction, Action/Adventure, Paranormal or Fantasy. Repeating my original opinion of Reign of Blood, as well as now with the whole series: It truly has no genre…except AWESOME! WOW!!!! Book 2 does not disappoint!!! Loved as much as the first. I am definitely a fan for life. The writing is beautiful and vivid. You get a moving picture in your mind with the taste and smell and feel of everything you're reading. Definitely a 5+++ star book/series in my mind. Alexia Perdy is in my top must-drop-everything-and-read-now authors. Only 2 other authors have ever made that list. I do have 2 very small things that bothered me a little but not enough to take away from the 5+++ sta WOW!!!! Book 2 does not disappoint!!! Loved as much as the first. I am definitely a fan for life. The writing is beautiful and vivid. You get a moving picture in your mind with the taste and smell and feel of everything you're reading. Definitely a 5+++ star book/series in my mind. Alexia Perdy is in my top must-drop-everything-and-read-now authors. Only 2 other authors have ever made that list. I do have 2 very small things that bothered me a little but not enough to take away from the 5+++ stars. 1. When certain parts of the story were being told from a different perspective than Aprils I felt they should have been told first person as well but it worked just as well the way it is. 2. I noticed this in book 1 as well a repetition of "arresting my breath" "my breath was arrested"
I miss it already! Alexia Purdy could write five more of these books and I’d still want to know more about April, Jeremy, Rye , Christian and Elijah. I devoured this book just like I devoured book one. The book left me wondering about the various characters and how their lives go on after the latest twist. Hearing directly from someone other than April was a nice touch because it let you get to know a few other major characters. I was disappointed when April bonded with someone other than Rye, b I miss it already! Alexia Purdy could write five more of these books and I’d still want to know more about April, Jeremy, Rye , Christian and Elijah. I devoured this book just like I devoured book one. The book left me wondering about the various characters and how their lives go on after the latest twist. Hearing directly from someone other than April was a nice touch because it let you get to know a few other major characters. I was disappointed when April bonded with someone other than Rye, but when she later acknowledges her feelings for Rye it does make up for it a bit. Seeing an old character revived and finding out that he’s not necessarily a villain was a nice twist. I found myself thinking that Christian wasn’t so bad after all. I loved this book!! REIGN OF BLOOD, the first book in this series was one of my favorite books I read last year, so I couldn't wait for this book to come out. April is a character you can't help but love. She's tough, but she has heart too. Purdy writes her in a very endearing way, and as a reader I felt very connected to her. I love how the story unfolds in DISARMING. I was curious where the story could go after the first book and I was pleasantly surprised by the twist and turns in this book. I loved this book!! REIGN OF BLOOD, the first book in this series was one of my favorite books I read last year, so I couldn't wait for this book to come out. April is a character you can't help but love. She's tough, but she has heart too. Purdy writes her in a very endearing way, and as a reader I felt very connected to her. I love how the story unfolds in DISARMING. I was curious where the story could go after the first book and I was pleasantly surprised by the twist and turns in this book. I love the addition of the new characters in this book, and there was one huge shocker that I wasn't prepared for. Reign of Blood was an amazing read, so I was eager (if a little hesitant) to continue April’s story with Disarming. I was far from disappointed, and was completely drawn in (yet again) within a few pages. The writing style flows so smoothly, and the author describes things in such detail that your imagination will just take you away. New characters are introduced, who fit into the story well and only add to the series. A complete roller coaster of emotions, there are so many twists and turns I couldn’t put the book down, needing to know what happened next. A series not to miss, this book will have you turning the pages late into the night. But when she hears of a potential city of survivors managing to hide and thrive away from the vampires, she has to check it out. Alone if she has to. I finished this book feeling dissatisfied – and I don’t think it was down to the world building (which is a fairly decent dystopian zombie apocalypse with vampires holding the zombie spots with a few unique little additions) or the characters (though I can’t say any of them thrilled me). It was primarily down to structure. I feel like there were a number of story-ettes that were started, kind of wibbled around a bit, and then shuffled away sort of embarrassed. Kind of like a chorus of singers who suddenly realise they can’t remember the words. I think a lot of that comes from the author having an idea of how they wanted the book to end, but not entirely sure how to get from the end of the last book to that point. Which, in turn, may have been because the last book felt like a stand alone (I was actually surprised to find this book existed) which has now been stretched into a series. So it feels convoluted – like this couple needs to split up for the plot (or not be a done deal), so they’re split up. Here’s an excuse – but it’s a half-assed one that isn’t followed up. The same applies to April’s curiosity – she wants to examine the city full of humans; which takes precedence over her (repeatedly moped about) split up with Rye AND the family which is the reason for that split up. And why does she decide she needs to rush off and do this alone? Because she thinks the vampire hybrids may try to wipe them out without consulting her – but when we switch to Rye’s point of view, the hybrids seem to be adopting a policy of leaving the humans alone. He could tell her that… but without these leaps of logic and dubious foundation, April wouldn’t have any motivation to go wandering off in dangerous places all alone. And April’s back, this time with more romance, more blood and more excitement than the first book! Remember how the only thing I really had to criticize in Reign of Blood was the unrealistic dialogue? Well, that’s mostly resolved in Disarming, thank goodness. We get a lot more character interaction so good dialogue is essential and although it’s far from perfect, it’s so much better. As for the plot, it’s just as fast-paced as ever. We start out with April and the lovesick Rye trying to solve the mystery of a large colony of humans still living in the city and once we learn the truth of their colony everything spirals out of control. I don’t think I’m spoiling too much when I say that yes, there’s a love triangle in Disarming. Is it annoying? No. Is it believable and does it develop organically? Absolutely! I love that huge twist Alexia Purdy used the love triangle to create because heaven forbid love triangles have a purpose in the plot other than to create needless drama. Just when you think everything will develop perfectly between April and Rye despite April’s reluctance, an old friend from the first book pops up and we have ourselves the first good love triangle in a long time. April and Rye are still awesome characters and I have to say that April really did a lot more maturing in Disarming. She was already mature, but she becomes even more like an adult in this book because so much happens to her and her poor little brother. Some of the choices April has to make in the last part of the book show how much she’s changed and they definitely make me eager for the third book, Amplified. Aside from the crazy fast plot, my favourite element of the book is the actual vampires. You have your feral vampires, your traditional sane vampires, humans and then there are hybrids like April. I don’t want to give too much away, but you’ll discover a terrifying new type of vampire by the end of the book. It just goes to show that not everything is as it seems and like all species, vampires also evolve as time goes on. 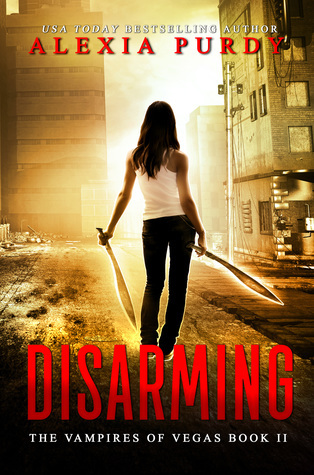 Truly, even if you aren’t a big vampire fan you’ll love Disarming. Disarming picks up right where Reign of Blood ended. Now with the prologue of this story I was a bit confused at first going okay what does this have to do with that? I do not remember this person. But later on it became clearer, and I understood the prologue. I have to say that was cool writing that in there. April has some tough things coming her way in Disarming, how will she hold up. April and Rye have some unfinished business but April being her I received this book to give an honest review. April has some tough things coming her way in Disarming, how will she hold up. April and Rye have some unfinished business but April being her stubborn self doesn't seem to understand Rye's feelings for her. April is trying to take care of her mother and brother in this world of vampires. When something happens to someone close to April, she doesn't know what to do. There are plenty of twist and turns going on that you are wanting more and more. This was a book I could not put down. Rye is trying to be patient and supportive while April gets her e This book is fantabulous (yes I know it's not a real word but I don't care lol), it picks up right where Reign of Blood left off. April has a lot more to deal with internally and externally in this one. She's got her family back but they are changed by the time spent as captives in the other hybrid group ran by deliriously sick Christian. And who wouldn't? Being tortured would change everyone! But mom is acting stranger day by day. The first book 'Reign of Blood' started well into the vampire apocalypse with the great first line " Never tease anything that wants to eat you" so where would this, the second book start, it starts at the beginning April and her best friend Sarah are travelling home from a study session they hear the screaming but have no idea what's going on and its not until April gets home that she gets an idea of just how bad it is. After her ordeal in the last book Aprils mother is a Great second in series. After her ordeal in the last book Aprils mother is a shadow of her former self and April takes on the role of Parent but a discovery sends April on a mission where she meets not only danger but people she thought she'd never see again. Now I've become quite addicted to this series, the first book was spoilt only by April and apart from her 'too stupid to live' moments she's better in this book, I do hate those moments I hate it when any character in any book makes one but since it's nearly always a female I hate it more. The other problem I had was Elijah, I don't care if he was preoccupied or whatever but seeing another human above ground and especially after so long.....I didn't buy the way he acted at all. Ok so he had a 'too stupid to live moment' as well, equal opportunities and all that. A terrific post apocalyptic tale woven by the amazing Alexia Purdy! With Reign of Blood (books 1) she brought me into this whole new world where there are no such thing as sparkly vampires. It was difficult for me being that I adore my vamps & all things sparkly! BUT...she did such a great job of creating this whole new world that I did not miss the sparkles or anything else for that matter for my whole trip there. After reading book 1 I knew book 2 was in my near future. Soooo...on to book 2...I love this story even more now than before! It's even more intense with never ending twists being thrown at us. Prepare yourself as our beloved characters grow & adapt causing momentary "NO!! WHY???? WAIT ... WTH JUST HAPPENED!?!" moments that may leave you with a few unresolved feelings yourself. Add that to all of the awesome zompire action plus new reasons to be afraid of the dark & we definitely have a 5 star winner. I really enjoyed Reign of Blood so when I got the opportunity to review Disarming I jumped at it. This story picks up right where Reign of Blood ends...April is just fascinating. I love her character..her strong will to survive is awesome! I could never really grasp the relationship between Rye and April and now I completely understand. I wont give anything away...You will have to read it..but everything makes sense now. I will say that I think Disarming was even better than Reign of Blood. You I really enjoyed Reign of Blood so when I got the opportunity to review Disarming I jumped at it. I will say that I think Disarming was even better than Reign of Blood. You really get to know the characters and understand what they are going through. I also like the addition of some "old" characters as well as new characters. My favorite addition would be the new "Guards" and their leader Elijah. Another new character emerges from April's past and I enjoyed "her" as well. An enjoyable read continues the story of April Tate and her family, who have survived the viral apocalypse that has pretty much wiped the human race from the planet. It has left a struggle for survival against not only “zompires” or feral vampires but hybrid creatures who are either a super human or super vampire. The question remains is anyone who is just a human left. There are a few twists and turns to the plot that throw you off expectations that were set up in the first book. Just keep up wi An enjoyable read continues the story of April Tate and her family, who have survived the viral apocalypse that has pretty much wiped the human race from the planet. It has left a struggle for survival against not only “zompires” or feral vampires but hybrid creatures who are either a super human or super vampire. The question remains is anyone who is just a human left. There are a few twists and turns to the plot that throw you off expectations that were set up in the first book. Just keep up with the story and you will love where it is heading. The addition of new characters, some old friends and even a few old nemeses will turn up along the way that will leave you exasperated and thrilled. Highly recommend the entire series. It is well thought out and makes wonderful use of the terrain of the Las Vegas valley to add to the story. There are local landmarks that are well established and maybe even visited so you can picture events as they unfold for many characters. “Time is truly apathetic to the many to whom a little empathy would mean so much.